Nothing belongs in the Estuary as much as a Thames Barge – and nothing looks quite as exotic. 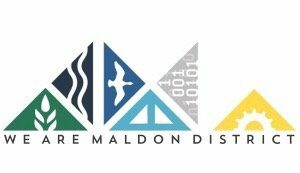 We lugged our sail bags along Maldon town quay, past the moored yachts and cars and pedestrians. Suddenly beyond all the masts, there was the instantly recognisable rigging of the Thames Barges, they were gathered at the end of the quay next to the other yachts like a number of praying mantis, temporarily forced to share digs with a crowd of small white beetles. 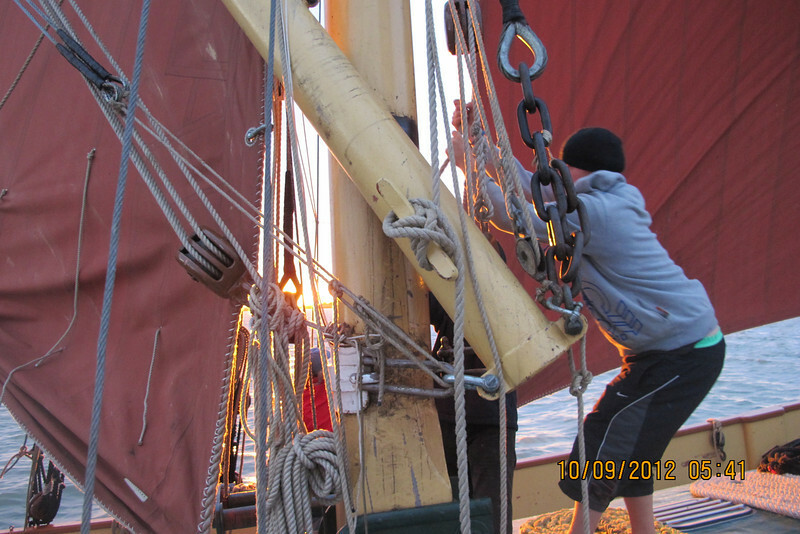 Then we were walking up the gangplank to the Cambria – for the first time, up close and personal with a Thames Barge. Everything is … big. Enormous blocks and tackles. Massive cast iron two-person winches. Huge coiled ropes, set in spiralling patterns to cover the vast roof of the hold, the great cargo belly of a Thames barge. The skipper and mate had the unassuming good humour and self-possession of people who know their jobs inside out and are aware that they don’t need to sell to anybody the charismatic, iconic vessel they have in their charge. We all had a cup of tea on the deck. They were relaxed in their jeans and ordinary shoes, and we eager south coast sailors, with our neoprene and three-layer system kit, felt not quite as cool – but that didn’t matter because we were spending the weekend sailing on a Thames Barge, and that was supremely exciting. The Cambria has no engine but with a quick tow off the quayside, we set off downstream in the early evening sun for our first sail to Brightlingsea. We hoisted sails two to a rope, and as they filled felt the massive weight of the hull stir beneath our feet. We took turns to steer and peered out of the wheelhouse along the vast bulk of the vessel stretching out in front. I marvelled at how a light breeze could move the vessel so easily though the water, thrilled at how a slight turn of the wheel could affect its direction, picked a cloud and sailed to it. And the barge responded majestically. We sailed along the flat Essex coastline as the sun slipped down towards the coastal flats, soon the sky glowed flame red and in a light breeze we edged quietly into the anchorage. The only sound in the hush was water-birds calling across the marshes, the darkening water and the flat black land under the vast glowing bowl of the sky. All was timeless peace and space. Ahead of us at anchor were the leggy silhouettes of other Thames Barges against the sunset, gathering together as arranged. The breeze pushed us slowly up the channel, the vast anchor rumbled out and we slid to rest beside the others. Daybreak on Race Day. The sky was lightening into a clear, calm dawn when we climbed out of our bunks. There was no time to waste to prepare for the race with breakfasts, tasks, the sorting of ropes, lowering the dinghy from its davits to row over and collect our mainsail trimmer who was sleeping on a nearby boat. Small and neatly dressed with a straw hat the trimmer didn’t say much but scrambled quickly up the high sides of the hull and embarked on a flurry of, experienced activity. At last, all was ready. We stared up anxiously at the still blue sky, praying for a breeze. The Colne fishing smacks were gathering. Due to race before us at 8am, they tacked around their larger Barge relatives as their countdown began. Every smack was somebody’s pride and joy, first built as working boats they had ageless elegance with their long bowsprits and slanted sterns. The smacks and their skippers were gathering for a race which was most of all a celebration, and sharing a feeling for these beautiful boats sailing under the same Essex skies as they had for generations. Now, the Thames Barge Race was due to start. Our fellow competitors had put motor on and sails ready, manoeuvring about above the Start Line at Bateman’s, negotiating their way to the best position. Our vessel the Cambria had no engine and with little breeze, we had no choice but to stay anchored until the start signal was given. We watched with jealousy as the signal was given and the other Thames barges set off on the race. But our skipper remained calm and finally, when all was clear, we raised our anchor, let out our sails in the still air, and the barge slowly turned in the tide towards the Start line. With my nagging worry now laid to rest that we would drift backwards through the start line (not a good look) the vessel straightened up, and a slight breeze began to rise as we headed towards open sea. The Cambria, without hurry or panic, began to impose her personality and presence on the race. We rushed to carry out our tasks, struggled with unfamiliar techniques and terminology, we hauled sails two to a rope, sweated over huge cast iron cogs of wheels and winches, cranked up and down the leeboards folded against the hull like a dodo’s wings. The cups of tea kept on coming, we kept on grinding the winches, and we all held our breath every time the wind direction was tested with the smoke from a cigarette, and our course adjusted. The chanting calls of the skipper in the wheelhouse carried across the expanse of deck up to the bow a sing-song cry of “leggo!” guiding the crew through the tack, like a chant from the Far East via Essex. Steadily, smoothly, the Cambria slid up the fleet and we admired the huge vessels with their own slow grace, rounding the race course in a stately dance. At last we were back at Bateman’s Tower, the Race Officers astonished to see that after our slow start, the Cambria had seen off all the competition bar the Edme. Later we went ashore to the Prizegiving at Brightlingsea Sailing Club and cheered our Skipper receiving the Sailorman Cup as the Second Barge Home. A fish and chip supper rounded off an almost perfect day, a day during which a thought humming somewhere in my head had been – not so far away, this has been going on all my life – these incredible boats, their presence and style grounded in centuries of purpose, in today’s world still cared for, sailed and raced by the community of people who live on this flat coast with its peace and huge skies, together with a few lucky visitors. I did not know this unassuming and exciting thing was going on. How could I not know about this until now?